Anna, the sister who brings a lawsuit against her parents, claiming the right to her make own decision about what medical procedures can be performed on her. Jesse, the prodigal brother, whose drug taking and criminal tendencies throw a wrench and add conflict to the family's growing list of problems. The parents, Brian and Sara, who have a baby, Anna, who is genetically selected to be a close donor match for Kate. At birth and ongoing into her early teens, Anna is called upon to undergo increasingly protruding and dangerous procedures to provide blood, bone marrow, and other tissues to sustain her older sister's life. Anna's mother Sara, an attorney, decides to represent her own daughter Kate at the trial. The mysterious attorney hired by Anna comes with a host of his own problems. Sara's obsession with saving her daughter. Brian's quiet desperation for his family and hidden feelings that he can't delude about his wife. Kate's pain and lack of communication. I think you can understand by this list how complex this story is. How affected this family is. How there is not always a clear way or clear answers to some of the toughest questions a family can face in life. I wondered how they were making it work in their reality. I liked how the narrative switched around each character giving you a clear sense of the time period and what each family member was dealing with. Very interesting. Even Anna's lawyer and of the legal guardian appointed were included on many levels. It's hard to forget large portions of Sara's narrative which included flashbacks on the history of Kate's illness. It was sensitive in dealing with Anna's role in gaining medical support and it was arresting in the shadow of the constant toll and evolving of Kate's pain on the family. As I've learned a little about Picoult as an author, I found she likes to be controversial and that includes her endings. So, of course, I never saw it coming and I don't really think I liked it either. Time will tell the true impact of it as in whether I choose to forget or remember this story. So far, I haven't had the desire to see the movie. I've never read any Picoult and I'm not really wanting to, either. I read through all the spoilers of this and it just doesn't look that interesting to me. Ah well. i always thought Jodi Picoult was a chick-fic writer. now i'm thinking i was mistaken. I believe she's more women's fiction than chick lit. Of course, as I admitted above, I've never read any of her books, so I might be wrong. This movie got all four stars, but I had a feeling I'd cry from beginning to end. My life is depressing enough so I skipped it. I've not read any Picoult either but boy is she popular right now. Thanks for your honest review Julie! Amanda - I don't blame you and I wouldn't wholeheartedly recommend her either. Jesse's issues weren't fun to read either. Hamilcar - I would still consider Picoult chick-fic although she would work for women's fic too. 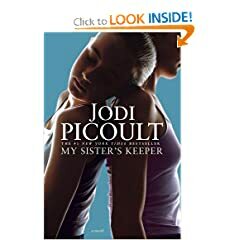 This was my first experience in reading a Jodi Picoult book and while I kind of enjoyed it, I've since noticed that her novels are pretty similar - They all tackle a 'sensitive' or 'controversial' subject that end up in a court room. Once you've read one, you've read them all. I saw the preview of the movie, and it really made me sad. I really wanted to see this last friday, but I went to the Proposal (sandra bullock)! Ceri - Thanks for your insight. It was my first time reading Picoult as well. I've also been wondering if her books are all very similar and I'm thinking that's most likely the case. Nina - I also thought the movie preview was sad which is what I expected because the book is sad. I still haven't seen the movie. I did see the Proposal and it did have some hilarious parts in it! Definitely, not sad.